June 2014: Despite continuous efforts of governments and partners to fight hunger in the Sahel, the situation remains of great concern. Since January 2014 and after an early start of the lean season, an increasing number of poor and very poor households with low levels or depleted food stocks will depend on markets to access food until the next harvest in August-September. Without adequate funding, measures that could prevent the food security situation from worsening are delayed and the capacities of vulnerable communities to cope with repeated shocks are further decreasing. 3 February 2014: The “2014-2016 Sahel Strategic Response Plan” is launched at FAO headquarters (Rome). It reflects a new approach to humanitarian response in the Sahel, adapted to the challenge of building the resilience of the most vulnerable population to recurrent crises. January 2014: An estimated 20.2 million people, or one in seven people in the Sahel, suffer from food insecurity. Among them, more than 2.5 million require urgent lifesaving, food and livelihood assistance. 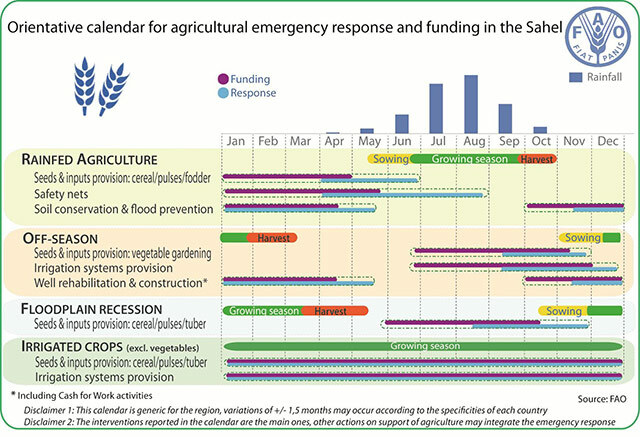 For the remaining millions living in stressed food security conditions, the risk of falling into Crisis and Emergency phases (Integrated Food Security Phase Classification) throughout 2014 is significant. 2005, 2008, 2010, 2012: Acute food and nutrition crises affect millions of people across the Sahel due to a combination of drought, high grain prices, environmental degradation coupled with chronic poverty and underdevelopment. Partners take all necessary steps to enhance the response to the crisis by scaling up their capacities to immediately assist millions in need. After an early start of the lean season this year due to localized rainfall deficits during the 2013 agricultural campaign, vulnerable households are faced with a degradation of their food access. 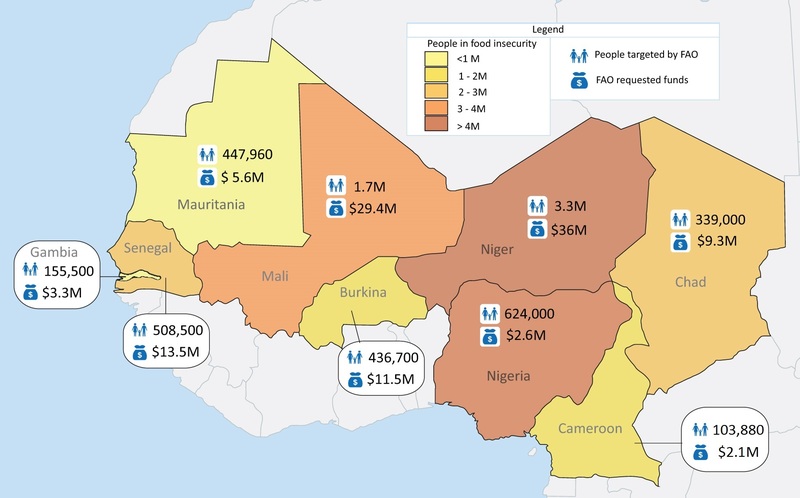 Displaced populations are fleeing the Central African Republic and Nigeria to seek refuge in Chad and the Niger and the increase of food prices in the region is exacerbating the already acute food security situation. 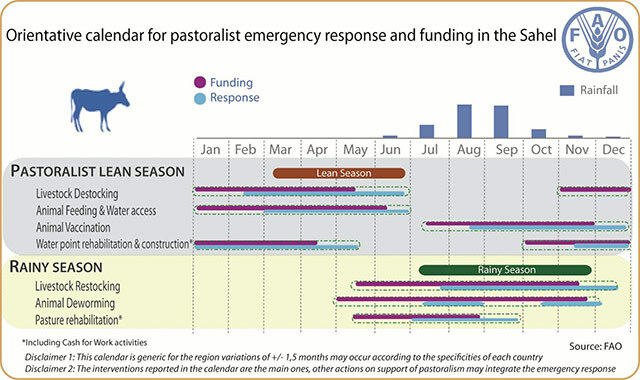 Furthermore, pastoralists will suffer a longer lean season due to the late rains expected this year. The majority of people in the Sahel rely on agriculture for their food and income. During and after crises, without adequate means to restore their livelihoods, they are forced to turn to negative coping mechanisms (sale of livestock and agricultural inputs, reducing the number and quality of daily meals, accumulating debt, decreasing expenditures for education, health and malnutrition-related care) leaving them even more vulnerable to future shocks thus aggravating food insecurity. 1. Collection of data on risks and vulnerabilities, analysis and integration of the results in the humanitarian and development programming. 2. Support to vulnerable populations to better face shocks by responding to early warning signals, reducing the length of post-crisis recovery and reinforcing national actors' capacities. 3. Coordination and integration of life saving assistance to people in emergency situation. For 2014, FAO is appealing for a total of USD 116 million to assist more than 7.6 million people with immediate livelihood interventions in the Sahel. Out of the USD 116 million required to support crisis-hit farmers, herders and pastoralists with immediate livelihood interventions in the Sahel, only USD 16.4 million has been received (14 percent of the appeal). With the contributions received, FAO is supporting more than 1.2 million vulnerable people in the Sahel. Vulnerable farmers have received quality crop seeds and tools for the main agricultural campaign. The assistance is now focusing on the provision of essential agricultural inputs for the preparation of the irrigated cultures and the lean season agricultural campaign based on vegetable and flood plain recession production. FAO also assists vulnerable pastoralists through the recapitalization of herds, the distribution of veterinary products, water point rehabilitation and trainings. These activities are essential to restore herders’ livelihoods after the difficult lean season. While these activities are crucial to protect the livelihoods of vulnerable people, the remaining needs are significant. The main agricultural campaign, based on the production of food crops, has not been funded adequately. Poor and very poor rural households that have limited access to agriculture and that do not benefit from livelihood support will continue to depend on casual labour for revenues, as well as on markets to access food. The most vulnerable families started selling their meagre assets, including livestock, as many are becoming indebted. Partners still have the opportunity in the coming months to support food insecure households by protecting and rehabilitating their livelihoods. Building on recent gains and ensuring the resilience of rural communities is crucial and this opportunity should not be missed.